Today’s Net Neutrality declaration by the FCC is unquestionably the most important telecommunications policy decision thus far in the 21st century. In recent weeks, it had become increasingly clear that this would be the FCC’s direction. There had been doubts, given FCC Chairman Tom Wheeler’s previous associations in the telecommunications industry. From 1976 to 1984, he was President of the NCTA and from 1992 to 2004, he was President & CEO of the CTIA, which lobby for the cable and cellular industries, respectively. Both groups oppose Net Neutrality today. “We asked the public to weigh in, and they responded like never before. We heard from startups and world-leading tech companies. We heard from ISPs, large and small. We heard from public-interest groups and public-policy think tanks. We heard from Members of Congress, and, yes, the President. Most important, we heard from nearly 4 million Americans who overwhelmingly spoke up in favor of preserving a free and open Internet. Ban Blocking: Consumers must get what they pay for – unfettered access to any lawful content on the Internet. Ban Throttling: Degrading access to legal content and services can have the same effect as blocking and will not be permitted. “These enforceable, bright-line rules assure the rights of Internet users to go where they want, when they want, and the rights of innovators to introduce new products without asking anyone’s permission. 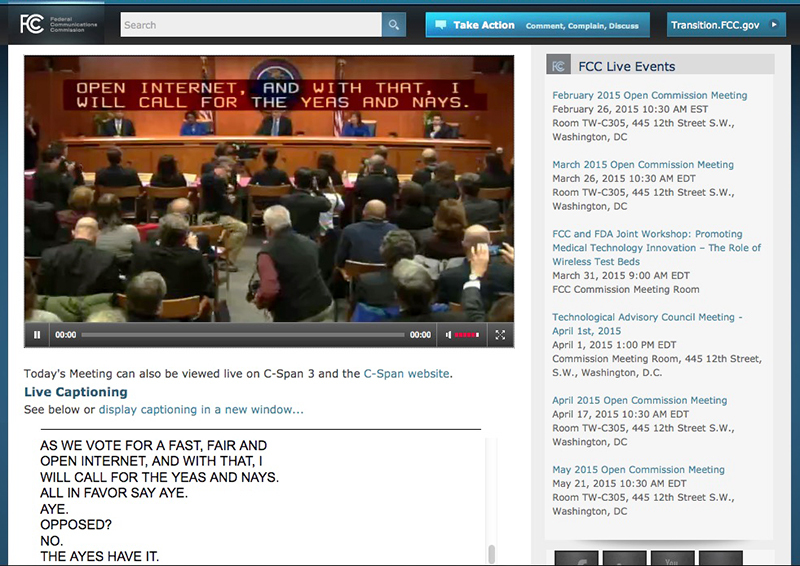 Those who watched the FCC proceedings online, as I did, were given a real treat. After Mr Wheeler’s opening statement, the Commissioners took turns to make statements of their own. Given today’s antagonistic political environment, the primary role of the two opposing Commissioners was to misrepresent the outcome and use scare tactic positioning as they expressed their disagreement with the decision. I must admit that they are very good at what they do. “The Internet will be slower and prices will be higher.” Large carriers attempt to justify their claim about slower speeds by saying that Net Neutrality would be a disincentive for them to invest in their networks. So AT&T or Verizon would actually give Comcast or a future DISH Network wireless broadband service an opening to take market share away from them? “Nothing in this order will promote competition… If you liked Ma Bell monopoly in the 20th century, you’ll love this in the 21st.” Actually, today’s ruling is very clear (see above) that there will be no preferential treatment for access or interconnection. Creating a level playing field that anyone can enter; a sound foundation for competition. *** It should be noted that the Universal Service fee helped give telephony to rural areas in the 1930s, and in a very real sense, helped incubate IPTV among rural operators a decade ago. Commissioner Pai used words like “takeover,” “sham proposal,” and “special interests” to position the Net Neutrality decision exactly inside-out from what it really is. He also claimed that the government didn’t create the Internet, hoping that listeners may have forgotten that the Internet was ‘invented’ by DARPA (the Advanced Research Projects Agency within the US Department of Defense, a government agency), and a community of government-funded academic institutions. The other opposing Commissioner, Mr. O’Reilly, also pulled no punches, calling the Net Neutrality decision an “unlawful power grab.” Then Mr O’Reilly went on about how Title II is all about price regulation and taxation. So the truth comes out: taxation is bad. Net Neutrality should be opposed because it is a new tax, and that “this is back door rate setting authority.” Despite explicit statements in the ruling that it is not. But read the FCC’s order, read the statements of each of the FCC Commissioners, and then decide for yourself. These comments by the minority Commissioners simply reflected the meme that had been running unchecked in the wild. One commenter went so far as to say that (I’m paraphrasing and can’t remember the source) ‘..only four million people submitted comments to the FCC, out of more than 300 million Americans,’ implying that the 4 million were meaningless. Today’s ruling put an end to the notion that “open access” to the Internet was to be a function of lesser or greater means. It’s that simple. I have no doubt that some of my friends and colleagues stand as opposed to Net Neutrality as I stand in favor. Everyone is entitled to their opinion. But as opposing parties begin to notice that Net Neutrality has opened market opportunities to them that otherwise would not have been available, they will thank the FCC. The Net Neutrality discussion overshadowed another important ruling that was announced the same day: that the FCC granted petitions from two community broadband providers in North Carolina and Tennessee, to expand broadband services into neighboring unserved and underserved communities. The opposition was from incumbent service providers. Previous articleA Fox in MLB’s hen house?